Fr. 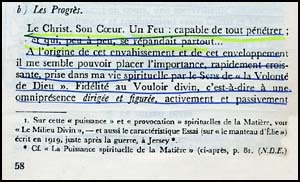 Teilhard de Chardin considers evolution a divine process in which spirit is liberated from matter. To avoid being judged a Pantheist, he gives religious names to this process. He calls the concentration of energy at the center of the evolutionary process the heart of Christ. 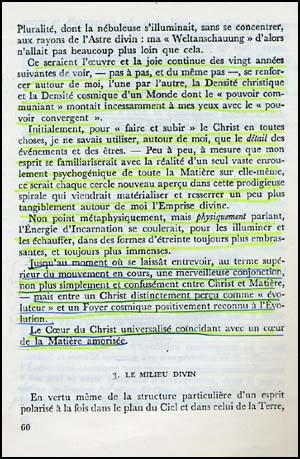 At right is a picture of the book Le Coeur de la Matiere [The Heart of Matter] where he expounds this strange thesis; at right, photocopies of the French text. Below, we present our translation. For the next 20 years, it was my work and continuous joy to see - step by step and at the same pace - both the Christic Density and the Cosmic Density of the universe getting stronger around me, whose respective "power of communion" and "power of convergence" continuously grew before my eyes. Initially, to "generate and bear" Christ in everything I only knew how to consider the significance of each event and being around me. Little by little, to the measure that my mind became familiar with the reality of one single vast psychogenic spiraling of all Matter [the ensemble of material things] around itself, I perceived that each new round of this prodigious coil would make the Divine Enterprise [evolution] materialize and become more tangible around me. Not metaphysically, but physically speaking, the energy of the Incarnation would flow to illuminate and heat the new rounds of the coiling, in ever more encompassing and immense forms of embracement. Then the moment came when I could make out at the apex of the developing movement a marvellous conjunction, no longer a simple and vague conjunction between Christ and Matter - but rather a union between a Christ distinctly perceived as "the evolutioner" and a cosmic Source positively recognized as "Evolution." The universalized Heart of Christ coincides with the heart of Matter transformed by love. 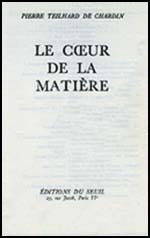 (Le Coeur de la Matiere, Paris: Seuil, 1976 pp. 58-60).